Suspense writer Lucille Fletcher, the first wife of Hitchcockian composer Bernard Herrmann, would have turned 95 today. She died in 2000. Her biggest hit? "Sorry, Wrong Number" (radio play, 1943; screenplay, 1948), in which a bedridden woman overhears the plotting of a murder over the telephone. To listen to the 1943 Suspense version starring Agnes Moorehead, go here. "The Day the Running Stopped." David Janssen, TV's Dr. Richard Kimball in The Fugitive, would have turned 76 today (he died in 1980). His other television mystery appearances include crusty private investigator Harry Orwell, aka "Harry O"; private detective Richard Diamond; and Jim O'Hara, U.S. Treasury agent. I recently rewatched "The Judgment," the final two-part episode of The Fugitive, in which Kimball confronts the one-armed man who killed his wife---the highest rated TV episode until the resolution of the "Who shot J.R.?" scenario of Dallas came along. As usual, I revelled in the quality of the writing and the vulnerability in Janssen's fine performance. I also was reminded of the Get Smart spoof, "Don't Look Back," featuring falsely accused agent Maxwell Smart pitted against "the one-handed man"---evidence of how The Fugitive, based on the Marilyn Sheppard case with unmistakable overtones of Victor Hugo's Les Miserables, had captivated the imagination of a nation. TV's Captain Kirk, who also costarred, pre-Star Trek, in an episode of "The Man from U.N.C.L.E." with Leonard Nimoy, turns 76 today. If you simply cannot start your day without listening to Shatner's immortal versions of "Mr. Tambourine Man," and "Rocket Man," go here and here. A February 27th presentation by Sara Paretsky at the Library of Congress, reflecting on 25 years of her P.I. character V.I. Warshawski, is now online here. This event was cosponsored by Mystery Writers of America and Sisters in Crime and presented in conjunction with the winter 2007 issue on Paretsky of Clues: A Journal of Detection. John Y. Cole, director of the LOC's Center for the Book, introduces Paretsky, and I provide some remarks at the end. 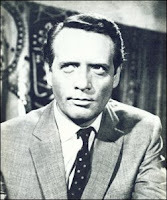 Happy 79th birthday to Emmy winner Patrick McGoohan, the original "Danger Man," frequent star on "Columbo," and guaranteed to scare the heck out of you as Joss Merlyn in Daphne du Maurier's "Jamaica Inn" (1985). Rebecca Rothenberg, talented musician, epidemiologist, and Agatha and Anthony nominee for The Bulrush Murders, would have been 59 today (she died in 1998 of a brain tumor), and her class and grace are sorely missed. Rothenberg's mystery series, which includes The Dandelion Murders and The Shy Tulip Murders, features microbiologist Claire Sharples. Her friend Taffy Cannon completed the manuscript for her last novel, The Tumbleweed Murders (2001). The Miami Herald's Carl Hiaasen, who won a Newbery for Hoot and was an Agatha winner and Edgar nominee for Flush, turns 54 today. He also shares his birthday with Beat icon Jack Kerouac, who would have turned 85 today. Elizabeth Linington, aka Dell Shannon, Lesley Egan, and Anne Blaisdell, was born today in 1921. She died in 1988. She was an Edgar nominee for Case Pending (1960) and Knave of Hearts (1962). Her characters include Lt. Luis Mendoza, Sgt. Ivor Maddox, Jesse Falkenstein, and Vic Varallo. Happy birthday, William Campbell Gault. Versatile mystery writer William Campbell Gault, whose work spanned the pulp magazines, adult novels (he won an Edgar for Don't Cry for Me and a Shamus for The Cana Diversion), and children's novels, was born today in 1910. He died in 1995. Ross Macdonald dedicated The Blue Hammer to him. And also of note: the late Mickey Spillane would have turned 89 today. In the United States, this month is devoted to the many contributions of women to history. 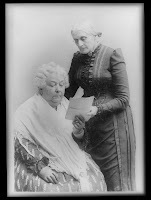 At left are legendary U.S. suffrage leaders Elizabeth Cady Stanton (seated) and Susan B. Anthony. For those looking for an account of the struggle by U.S. women for the vote, read Jailed for Freedom by Doris Stevens. Other resources about women's history may be found at the National Women's History Project and the National Women's History Museum; I also like this terrific resource on the history of women in law enforcement. Ellis Peters's The Virgin in the Ice and Sharan Newman's Death Comes as Epiphany show the lives of medieval women in religious orders. Glynis Tryon series by Miriam Grace Monfredo, starting with The Seneca Falls Inheritance, which features several suffrage leaders. Nell Bray series by Gillian Linscott, which features a disciple of British suffragists Emmaline and Christabel Pankhurst; the first novel in the series is Sister Beneath the Sheet. One of the best novels in the series is Hanging On the Wire, which deals with recuperating soldiers during World War I. Another mystery with a suffragist main character is Clare Langley-Hawthorne's Consequences of Sin. Anne Perry's series with Crimean War nurse Hester Latterly; a novel of particular interest is Slaves of Obsession, where Hester serves in the American Civil War. My chapter in Amelia Peabody's Egypt: A Compendium (ed. Elizabeth Peters and Kristen Whitbread) covers the women's history aspects in Peters's popular series featuring intrepid Victorian archaeologist Amelia Peabody Emerson (partially based on real-life Egyptologist and bestselling author Amelia B. Edwards). Mysteries that involve American women writers include Houses of Stone (under Peters's Barbara Michaels pseudonym); and Joanne Dobson's Quieter than Sleep (involving Emily Dickinson), The Northbury Papers (based on successful writer E. D. E. N. Southworth), and Cold and Pure and Very Dead (based on Peyton Place's Grace Metalious). Happy birthday, Arthur Machen, Nicolas Freeling, and Max Allan Collins. H.P. Lovecraft inspiration Arthur Machen was born today in 1863; the late Nicolas Freeling, the creator of Inspector Piet Van der Valk, would have marked his 80th birthday today; and the ever-energetic Max Allan Collins turns 59 today. 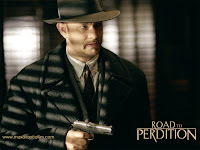 Collins, the author of Road to Perdition and many other works, will release Black Hats under the pseudonym Patrick Culhane in April 2007, which features the intriguing combination of Wyatt Earp, Bat Masterson, and Al Capone.